Toledo's decriminalization is challenged, Florida officials face heat for delays in implementing the state's CBD medical marijuana law, an Illinois panel approves medical marijuana for pain conditions (but will the governor go for it? ), and more. Ohio's attorney general worries that decriminalization could make Toledo a cartel hot-spot. Ohio Sues Toledo Over Municipal Decriminalization Ordinance. State Attorney General Mike DeWine, joined by the Lucas County prosecutor and sheriff, have sued the city of Toledo in a bid to overturn its decriminalization ordinance. Toledo voters approved the ordinance last month, becoming the first in the state to enact municipal decriminalization. The lawsuit objects to provisions in the ordinance barring police from reporting marijuana crimes to other agencies, making pot trafficking a "negligible" offense, and decriminalizing the possession of small amounts of other drugs. Toledo could become a cartel capital because of the ordinance, DeWine warned: "Absent legal action, it's not hard to imagine international drug rings making Toledo their regional base for operations," he said. Florida Lawmakers Grumble Over Slow Pace of CBD Medical Marijuana Implementation. At a hearing in Tallahassee Tuesday, lawmakers grilled Health Department representatives over delays in the program. "I mean, it's been almost two years since this bill was passed," said Rep. Greg Stube (R-Sarasota). "And we still don't have any restitution for these children that are trying to get this drug that the legislature recognizes is something needed for the state of Florida," he complained. The department said it was "mindful" of the need to make progress, but still couldn't say when five initial cultivation licenses would actually be issued. Illinois Panel Approves Medical Marijuana for Chronic and Other Pain. The state's Medical Cannabis Advisory Board voted Wednesday to approve chronic pain, intractable pain, and chronic post-operative pain. The additions must also be approved by Gov. Bruce Rauner (R), who earlier rejected 11 other suggestions for expanding the list of qualifying conditions. The board is also pondering whether to add autism, irritable bowel syndrome, osteoarthritis, and PTSD. Michigan Legislature Passes Asset Forfeiture Reform Package. The state Senate Wednesday gave final approval to a seven-bill package that will increase civil asset forfeiture reporting requirements and increase the burden of proof for seizures from "a preponderance" of the evidence to "clear and convincing" evidence the seized items were connected to a crime. The package has already passed the House. Some groups, including the Mackinac Center for Public Policy and the Michigan ACLU, want to see even deeper reforms, including eliminating civil asset forfeiture entirely and requiring a conviction before property can be seized in a criminal proceeding. But this is a start. Massachusetts Bill Would Block Sending Women to Prison for Drug Treatment. An amendment to a supplemental spending bill would prohibit women from being civilly committed to the Framingham state prison for drug treatment. The bill and its amendments are to be debated tomorrow. It's a move that was recommended by Gov. Charlie Baker's (R) task force on opioid abuse. Baker is looking for $5.8 million in the supplemental budget to pay for women in the prison for drug treatment to be moved to a hospital, most likely Taunton State Hospital. Competing legalization initiatives get filed in Massachusetts, pain patients face obstacles amidst the pill mill crackdown, the Yemen war is messing up the peninsular drug trade, and more. Two Competing Groups Filed Massachusetts Legalization Initiatives. Both the Marijuana Policy Project-backed Campaign to Regulate Marijuana Like Alcohol in Massachusetts and the local group Bay State Repeal today filed initiatives to legalize marijuana in the state. Bay State Repeal actually filed three versions of its initiative. Click on the organization link to get details on the various proposals. Leaked Document Shows DOJ Misled Congress on Impact of Medical Marijuana Amendment. 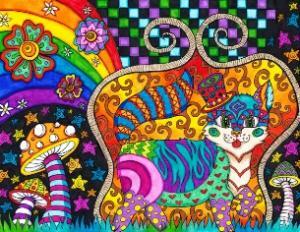 In the days before Congress voted to approve an amendment limiting the Justice Department's ability to interfere in medical marijuana states, an internal memo obtained by Tom Angell at Marijuana.com shows that the department tried to mislead Congress by falsely claiming that the amendment could "in effect, limit or possibly eliminate the Department's ability to enforce federal law in recreational marijuana cases as well," according to the document. [Emphasis added.] The memo admits that the DOJ talking points were "intended to discourage passage of the rider," but "do not reflect our current thinking." Click on the link for more. 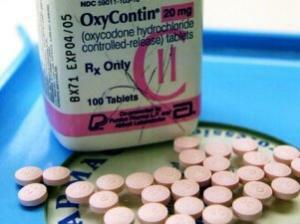 Pill Mill Crackdown Hurting Pain Patients. New Hampshire Public Radio has done a lengthy report on the impact of the pain pill crackdown on pain patients. One patient who moved to Florida reports that his pharmacy runs out of pain medications, and the pharmacy owner reported that pharmaceutical wholesalers will no longer distribute the amount of drugs he needs to serve his clients. There's much more there, too; click the link to read the whole thing. Yemen War Messing Up Arabian Peninsula Drug Traffic. Saudi Arabia's four-month bombing campaign against Houthi rebels is not only killing hundreds, perhaps thousands, of Yemenis, it's also choking off the supply of Middle Eastern amphetamines and hashish that have been being trafficked across the Yemen-Saudi border. Saudi border guards say the war has shut down trafficking, while Riyadh residents complain that supplies are drying up. The article also provides an overview of drug use in the region; click on the link to get it all. Recent DEA rules tightening access to prescription opiates are causing problems for veterans and others. Revised Alaska Marijuana Bill Removes It From Controlled Substances List; Adds New Misdemeanors. The legislature's effort to regulate legal marijuana has been revised to remove pot from the controlled substances list, according to an updated draft of Senate Bill 30. The bill would also create new crimes for misconduct involving marijuana, including selling it without a license, possessing more than six plants, transporting more than an ounce, providing it to minors, and making hash oil with a volatile or explosive gas. The bill got a hearing in committee yesterday. California's Attorney General Not Opposed to Legalization. Attorney General Kamala Harris, the state's top law enforcement officer and Democratic front-runner for a 2016 US Senate seat has said she has no moral objection to legalizing marijuana, but worries about impacts on children and public safety. "I don't have any moral opposition to legalization," she said, "but I do feel a very strong sense of responsibility as a top cop to pay attention to the details... to make sure that if it were legalized... that vulnerable people are safe." Private Group Sues Colorado Over Legalization. Two months ago, Nebraska and Oklahoma filed a lawsuit seeking to overturn the state's legal marijuana law, and now, two more lawsuits are being filed by a private group, Safe Streets Alliance, an anti-crime organization led by a former Reagan administration official. In one suit, two Colorado property owners are suing a handful of marijuana industry participants under federal racketeering laws and state and local officials under the charge that they are violating the constitution's supremacy clause by not enforcing federal law. In the other suit, Safe Streets joined with the Holiday Inn in Frisco to sue a number of marijuana industry participants on racketeering charges. That suit claims that a planned legal marijuana store is causing the hotel to "suffer injuries to its business and property." Pot supporters say the lawsuits are unlikely to go anywhere. Hawaii Senate Committee Passes Decriminalization Bill. The Senate Health Committee Wednesday approved Senate Bill 596, which would decriminalize up to an ounce, replacing a petty misdemeanor with a civil infraction and a $100 fine. Two Michigan 2016 Legalization Initiative Efforts Getting Underway. At least two different groups are eyeing a legalization initiative effort next year. East Lansing attorney Jeffrey Hank filed paperwork Tuesday for the Michigan Comprehensive Cannabis Law Reform Committee, while East Lansing-based Mitchell Research and Communications, a marijuana industry advocacy group, filed paperwork last month to create the Michigan Responsibility Council, which says it will soon transform itself into a ballot committee for 2016. Click on the link for more details. Missouri Bill Would Free Marijuana Lifer Jeff Mirzanskey. Rep. Shamed Dogan this week filed House Bill 978, which would require the release of anyone serving life without parole for marijuana offenses. That means Jeff Mirzanskey, who is 21 years into his life sentence. Efforts have been afoot to persuade Gov. Jay Nixon (D) to commute his sentence, but he has yet to do so. Activists Target Wasserman Schultz Over Medical Marijuana Stance. Democratic National Committee Chair Debbie Wasserman Schultz wants to move over to the US Senate, but she won't be getting any help from medical marijuana supporters. She opposed last year's medical marijuana initiative, and that has angered advocates. 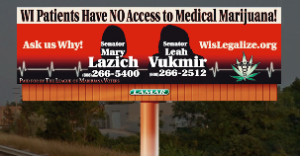 "She's voted repeatedly to send terminally ill patients to prison. And we're certainly going to make sure Floridians know that -- not to mince words," said Bill Piper, national affairs director with the Washington-based Drug Policy Alliance (DPA). DPA has been joined by People United for Medical Marijuana in Florida, the Marijuana Policy Project, and Americans for Safe Access in coming out against Wasserman Schultz. She opposed last year's medical marijuana initiative. Colorado Bill to Regulate Medical Marijuana Gets Stripped Down. The bill, Senate Bill 115, which seeks to make the state's medical marijuana system more like its recreational system, won preliminary approval in the Senate Wednesday, but only after some of its more controversial proposals were stripped out. Now absent from the bill are a move to crackdown on medical caregiver growers and rules requiring marijuana edibles to be refrigerated. The measure now renews the medical marijuana regulations that were passed in 2010. North Dakota Medical Marijuana Bill Defeated. A bill that would have brought medical marijuana to the Northern Plains was defeated in the House Wednesday on a vote of 26-67. The bill, House Bill 1430, was opposed by Attorney General Wayne Stenehjem, who warned of public safety and regulatory concerns and called it a step backward in fighting impaired driving. New Mexico Asset Forfeiture Reform Bill Filed. Rep. Zachary Cook (R-Ruidoso) has introduced a bill that would end civil asset forfeiture in the state. The bill is supported by an ideologically diverse range of organizations including the Rio Grande Foundation, the Institute for Justice, the American Civil Liberties Union (ACLU) of New Mexico, and the New Mexico Drug Policy Alliance. It does not yet have a bill number and is not yet available on the legislative web site. Wyoming Legislators Prepare to Try to Override Governor's Veto of Asset Forfeiture Reform Bill. Gov. Matt Mead (R) vetoed a bill that would have ended civil asset forfeiture in the state Tuesday, but the bill passed by a veto-proof margin, and now legislators and bill supporters are angling for an override vote. The measure, Senate File 14, passed the Senate 26-3 and the House 54-6. New Federal Opiate Prescription Rules Are Causing Problems for Veterans. Restrictions on prescription opiates adopted last summer by the DEA are causing hardships for veterans, the Washington Post reports in a lengthy piece. And it's not just veterans, but they're being hit particularly hard. Click on the link for much more. Former Federal Judge Regrets 55-Year Sentence for Pot Dealer. Utah resident Weldon Angelos has already spent more than a decade in federal prison after being convicted of three marijuana sales while he had a pistol in his sock. That pistol led to consecutive mandatory minimum sentences resulting in a whopping 55 years in prison for the aspiring rapper. Now, Paul Cassell, the then federal judge who sentenced him, wishes he had a do over. "I do think about Angelos," he said. "I sometimes drive near the prison where he's held, and I think, 'Gosh he shouldn't be there. Certainly not as long as I had to send him there... That wasn't the right thing to do. The system forced me to do it. I think that most of the time, our federal justice system succeeds," Cassell continued. "But there are some cases where it fails and the Angelos case is a prime example of that. I thought the sentence was utterly unjust to Weldon Angelos, but also unjust to the taxpayer," Cassell pointed out. "I think it's just a waste of resources to lock him up for 55 years, I don't really think anyone believes that's an appropriate sentence." 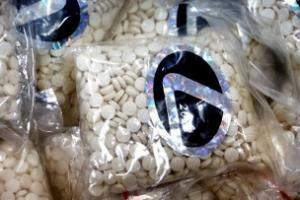 Utah Ready for Drug Defelonization, Poll Finds. Strong majorities of Utahns favor defelonizing drug possession offenses, according to a new survey from Public Policy Polling. Some 58% support defelonization, while 59% said probation and community-based drug treatment were more appropriate than jail for being caught with small amounts of drugs. The poll comes as a defelonization bill, House Bill 348, is introduced today. UK Liberal Democrat Leader Supports Medical Marijuana. Nick Clegg, head of the Liberal Democrats, the junior partner in a governing coalition with the Conservatives, has said people should be able to use marijuana to alleviate medical problems. "I strongly agree that where there is a proven medicinal use for cannabis for instance we should make that easier for those to have access to it in a straightforward legal way in order to alleviate the symptoms that you clearly have that you know as a user are alleviated by the use of cannabis," he said. "Let's take a more intelligent approach -- where there is a clear medicinal use, make sure you have access to that in a regulated way." This is yet one more way that the Lib Dems and the Tories are at odds on drug policy. 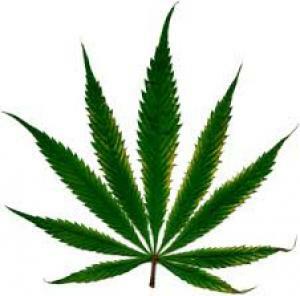 "Marijuana Middle" Identified in Third Way Poll. A new national poll from the centrist think-tank Third Way finds Americans almost even split on legalization (50% yes, 47% no), but with a broad and deep "marijuana middle" that may not support legalization in its own state, but does support federal action to allow states that have legalized it a "safe haven." Two-thirds said Congress should pass a "safe haven" law, while 60% said legalization should be up to the states, not the federal government. The poll also examined the demographics of the "marijuana middle." Click on the link for all the details. JAMA on the Impact of Marijuana Legalization. The Journal of the American Medical Association (JAMA) Monday published "The Implications of Marijuana Legalization in Colorado." (Click the title link to read the article.) The authors found an increase in reports of emergency room visits for marijuana intoxication, as well as problems related to the production of new marijuana products, ranging from burns caused by exploding hash-oil labs to problems associated with the overindulgence in edibles. But the authors also found that legalization was increasing access to marijuana for medical reasons, including pain control, where it is much safer than opiates. 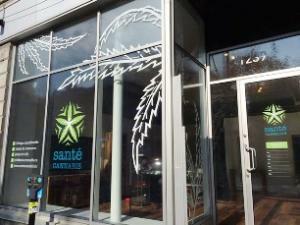 Anchorage Assembly to Hold Hearing on Banning Pot Businesses. At the behest of Assembly member Amy Demboski, the Anchorage Assembly will hold a hearing on her proposal to ban licensed pot businesses in the city one week from today. Supporters of legalization are looking for people to show up. Click on the link for more information. Illinois Appeals Court Rules Worker's Admission of Off-Duty Marijuana Use Not Sufficient to Deny Unemployment Benefits. A worker who was fired from his job after admitting smoking marijuana when confronted with a random drug test (which he passed) cannot be denied unemployment benefits, the state's 5th District appellate court has ruled. The case is Eastham v. The Housing Authority of Jefferson County. It's Official -- Nevada Initiative Qualifies for 2016 Ballot. Nevada is first out of the blocks to legalize marijuana via an initiative in 2016. Secretary of State Ross Miller Monday certified that the initiative had qualified for the ballot. Now, voters will have the opportunity to legalize it in the 2016 elections -- unless the state legislature acts first to approve the measure. Doctors Are Cutting Back on Prescriptions for Pain Relievers. In a study published in the Journal of the American Medical Association (JAMA), researchers report that half of primary care physicians are reducing their prescribing of opiate pain relievers compared to last year and that 85% of doctors believe they are overprescribed. The doctors reported concerns about addiction, overdoses, and traffic accidents. But an even greater number -- 90% -- were confident in their own ability to correctly prescribe opiates. Meth in Iran. Reuters has a report on the increase of methamphetamine use in the Islamic Republic. 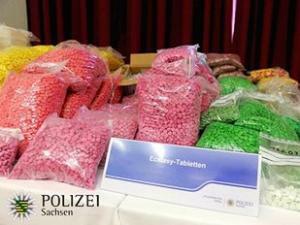 The news agency notes that meth seizures more than doubled between 2008 and 2012 and that last year alone, the government seized 3.6 tons of speed. The report cites experts as saying the rise of meth is being driven by increased development in the country and a more complicated and faster-paced lifestyle. 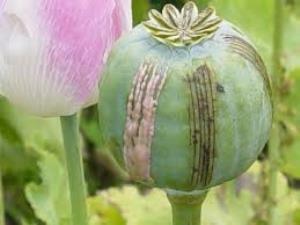 Opium Production Thriving in the Golden Triangle, UN Reports. Opium production in Southeast Asia's Golden Triangle has increased for the eighth straight year, the UN said Sunday in its Southeast Asia Opium Survey 2014. The acreage under cultivation increased slightly, giving the region to ability to produce about 76 tons of heroin. Myanmar accounts for most of the Golden Triangle production, and the Shan State accounts for most of Myanmar's production. The Golden Triangle is the world's second largest opium production region, behind Afghanistan, but only produces about one-fifth the amount Afghanistan does. 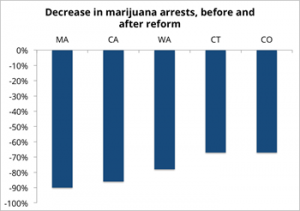 Chart from the CJCJ's report on the impact of marijuana law reforms. MPP Files Campaign Committee for 2016 California Initiative. And so it begins. The Marijuana Policy Project today filed with the California secretary of state to create a campaign committee to support a 2016 marijuana legalization ballot initiative. The group says the committee will be part of a broad coalition working to legalize marijuana in the nation's most populous state. That coalition will be working on an initiative draft in the coming months. CJCJ Report Examines Impact of Marijuana Law Reforms, Supports Legalization Over Decriminalization. In a report released today, the Center for Juvenile and Criminal Justice examines the impact of pot law reforms in states that have either decriminalized or legalized the herb and calls legalization the best policy choice. The report is Reforming Marijuana Laws: Which Approach Best Reduces the Harms of Criminalization? A Five-State Analysis. Pennsylvania Medical Marijuana Bill Headed for Senate Vote Today. The bill, which was amended yesterday in the Appropriations Committee to ban the use of vaporizers and to greatly narrow the list of allowed conditions for using medical marijuana, is set for a Senate floor vote today. Pennsylvania Report Says Heroin Cheaper Than Beer. The Center for Rural Pennsylvania (an agency of the state legislature) has issued a report on opiate addiction in the Keystone State that finds that heroin is cheaper than beer and is sold through sophisticated retail networks. The report, Heroin: Combating this Growing Epidemic in Pennsylvania, recommends a variety of legislative actions, including passage of bills creating a statewide prescription drug database, "Good Samaritan" laws, and making the opioid overdose reversal drug naloxone more available. Anti-Addiction Activists Call on FDA Head to Resign. A group calling itself FED UP: A Coalition to End the Opioid Epidemic today released a letter calling for the resignation of Food and Drug Administration (FDA) Commissioner Dr. Margaret Hamburg because of "the FDA's continued approval of new, dangerous, high-dose opioid analgesics that are fueling high rates of addiction and overdose deaths." The group takes issue with the FDA's approval last year of the new opioid pain reliever Zohydro, but it also criticized the agency for approving new drugs that are actually designed to be harder to misuse, such as Targiniq, which combines oxycodone with naloxone. FDA spokeswoman Erica Jefferson defended Dr. Hamburg, saying she had to balance concerns about abuse and public safety with those about adequate access to pain medications. "Preventing prescription opioid abuse and ensuring that patients have access to appropriate treatments for pain are both top public health priorities for the FDA," Jefferson said in a statement. California Defelonization Initiative Has Healthy Lead in New Poll. A poll released yesterday by the Public Policy Institute of California has the state's defelonization initiative, Proposition 47, winning with support at 62%. The initiative would turn drug possession felonies and some other low-level nonviolent offenses into misdemeanors. Bermuda Activist Sues Premier Over Medical Marijuana. Attorney Alan Gordon has sued Premier Michael Dunkley as part of his campaign to ease access to medical marijuana on the island. Gordon accuses the government of creating a double standard by not arresting him for openly cultivating medical marijuana while prosecuting atheists and Rastafarians for the same offense. Serbian Health Minister Supports Medical Marijuana. Serbian Health Minister Zlatibor Loncar has said marijuana provides "good results in medicine" and announced he will open a public debate on the issue. "The ministry would not prevent the introduction in medicine of anything that gives results for treatment, including marijuana. There are results showing that cannabis gives good results in medicine. We do not want to make decisions for one day, though. We want to meet people with all the details," he said.